MICHELIN XCE RD 3 – solos. 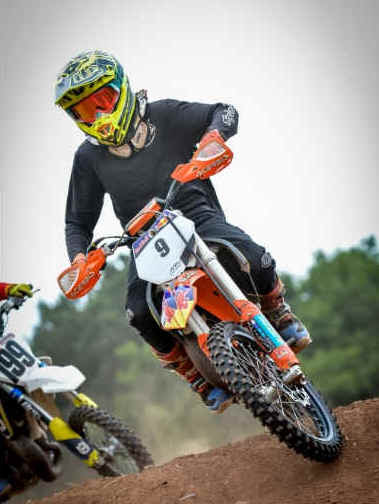 WOR Events produced a massive weekend of off road Enduro action last weekend at the Club’s amazingly popular and well-established Baden Hall venue in Staffordshire. The Club had undertaken a full track grade and restoration at the course back in early May and it was in simply prime condition for last weekends full schedule of events. Even in hot and dusty conditions with baked hard areas it still was a 5-mile lap of quality XC riding for all the riders that took part over the course of the weekend with endless woodlands and open grasslands mixed in with concrete roads and gravel trails making what is quite possibly one of the best XC Enduro tracks in the country. 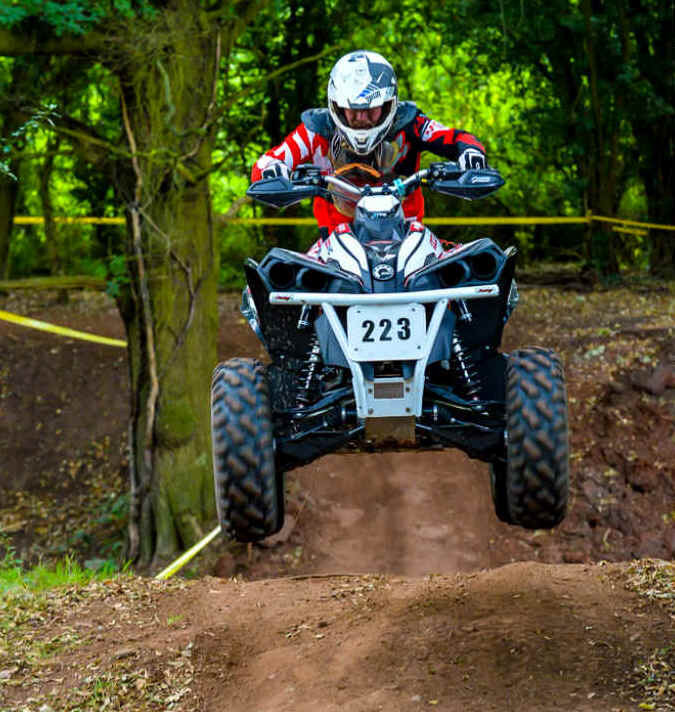 Returning to it’s old (and much more popular) Saturday Afternoon slot, at 3pm, the 2.5hr race saw David Tokarz carry on his run of superb form in the 4x4 Expert Class as easily cruised to the class and overall win on his big Can-Am with a smooth and fast 12 lap ride. Runner Up in the 4x4 Experts was Endaf Owen as he matched Tokarz for number of laps but finished a good 8 minutes adrift of the winner. Endaf still doing enough to be 2nd in the overall as well as class results. 3rd place going to Dean Foster on 10 laps after having had power steering problems on lap one, Foster shot back to the van to do running repairs and get back out there for some valuable championship points. 4x4 Clubman was topped by Nick Key after a bar to bar race for the entire race with Eventual Runner Up by only 19 seconds, Neil Martin. Martino and Nick where both on 12 laps and the only riders in class to do so as 3rd place on 11 laps went to Shaun Welleans whom is always there or thereabouts on the podium. The 2WD Enduro class was won by Laurence Stopps as he powered the machine to a fine 12 laps. The big lad being the Only rider in class to complete 12 laps as forced Shaun Murphy and David Hull into second and third place respectively with both on 11 laps and Murphy taking 7 minutes out of Hull. Hull finishing the race though with a very poorly sounding Honda 450. A special mention must go to Sheldon Seal, What a quad rider!! He started at the back and by lap 3 was way out in front overall and riding the unforgiving Baden Bumps and woods like he was on a magic carpet. Unfortunately, though a big crash on lap 5 ended his race 55 minutes in as the quad landed on him and hurt his knee, not what he needed as he was using the event as practice for a big upcoming quad race, but fairs fair the lad can fly on 4 wheels. The Quad rd 5 went off very well received indeed and like state earlier, the Saturday afternoon race slot seemed welcome and my now make a full time return to the calendar. Well done to all the riders that took part and especially to the podium riders in all classes. 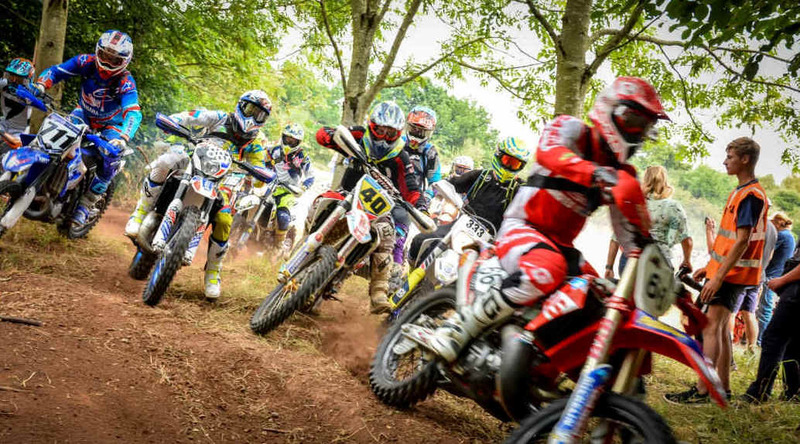 THE KIDS RACE – Michelin XCE Rd 3. The kids had a brilliant course set out for them and a cracking turn out of nearly 40 Youth riders was well deserved for the perfectly planned track. The course was totally achievable and more importantly, enjoyable for all the Youth riders. It tested the better, faster riders but also allowed the youngsters finding their feet in racing, a chance to get around and get plenty of laps under their belts. The track had lots of woods, big powdered berms, tricky ups and downs, a sprint on one of the old Army base roads and a big mix of nice grassy fields to test the kids on the varying bikes and ages from 8- 13 that lined up. Top Youth rider on the day was Cynan Jones from Merthyr on his KTM 85 in the 12-13Yrs class as he blasted to 20 laps and a 1 minute 50 plus seconds advantage over Runner Up, Ryeden Dennis. 3rd place Morgan Williams whom was only 3 seconds off Dennis at the Chequered flag. Sam Hughes was matching them all on 20 laps and was indeed only 7 seconds adrift of Williams come the flag, so a few places may well have changed if the race had gone on a few more laps that’s for sure. In the 10-11 Yrs group it was Alfie Barber out in front with an 18-lap score to his credit, one up on his nearest rival, second placed Laiton Perks whom was on 17 laps same as 3rd placed Tom Dyson but a 3-minute advantage was Perks. Jaydon Jones was in a class of his own in the 8-9 Yrs group as he blasted to 19 Laps a full 4 Laps clear of his nearest rival. Jones was super smooth over all the terrain and certainly looks to riding more like a 21-year-old than the Tiny rider he really is. Runner Up was Hari Walton going brilliantly on 15 laps with Austin Sandford 1 minute and 5 seconds adrift also on 15 laps. All of the kids did brilliantly, and the challenging track was simply superb for Riders and parents alike as they all enjoyed this WOR spectator special and could see their little ones doing awesome things on motorbikes in a safe and very professional environment with piece of mind that so many quality and top-notch safety marshals where out on the course keeping an eye out for and helping all the youngsters. THE ADULT RACE: PUTOLINE NHS RD 5 & MICHELIN XCE Rd 3 ..2 and 2.5hrs ..
Rounding out the weekends Enduro Festivities was the main event, The Adult solo race with a very healthy line up of riders ready to do battle on the full challenging lap the WOR had set out for them. The heat and humidity would also be a challenge as the continued good weather was out in force. 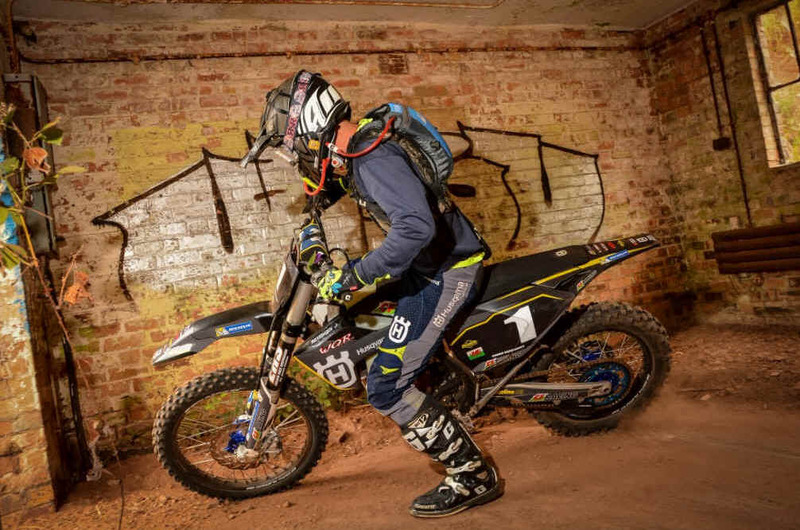 Leading with ease from start to finish was CF Racing Husqvarna 350 FX Mounted Owain Humphreys. Owain on this form is pretty much unstoppable at Hare Scrambles (unless Knighter or Gethin his Younger Brother is there to challenge him). Smooth, strong and fast is how the North Wales based Power house muscles the 350 4t round the WOR tracks and he did so 13 times last weekend with a winning margin of almost 3 minutes (bar 5 seconds) on Runner -Up, Yamaha rider, Jack Ditchfield whom in turn put in a 2.30-minute advantage over 3rd placed Tim Forman. Forman pushed hard on the Beta 300 to eventually take the final podium place from Connor Bolsover whom had pushed hard all race at the sharp end on his 300 Husky to be unlucky not get some silverware, Bolsover certainly regaining some form though in the last few races. Top Over 40 A class rider was Lincoln Brewster with an accomplished ride and some quick lap times to take a comfortable 4 minutes winning margin from Runner Up, Darren Skillin with Jason Clarke in very solid 3rd place albeit a lap down on Brewster and Skillin. Clubman Victory was Dawson Marriot (GASGAS 250) as he finished less than a minute from Harry Eccles as Runner Up and Arch Collier in 3rd spot. Marriott and Eccles the only riders in class to do 13 laps, it was also good to see Eccles back in a WOR race after a long lay off and more importantly back on the podium. Top Over 50 as expected was the flying Yamaha of Chris Wagstaff as he dominated the 2hr race and the Over 50 group with 10 Lap score and a 7-minute advantage over Runner Up, Simon Nutter. Nutter in turn was over 2 minutes and 30 seconds clear of 3rd placed Stephen Parry with all the top 4 riders including Mark Plain completing 10 laps. Over 40 B kingpin was Paul Lightfoot, Lighty is on a good run of form in the Vets B at the moment as he has really gelled with his 350f Husky. His main rival in class Anthony Foulkes is never far away though and same again last week as just 12 seconds separated the top two with both on 10 laps. 3rd placed Chris Farrar managed 10 laps also but was 5 minutes plus down on Foulkes. Young Sion Hughes is proving a real a handful for the rest of the Sportsman class as he took the class win on his Husky with a 17 second advantage over Adam Bates as Runner Up. The two riders where never far apart for the entire race with both riders having a 2-minute advantage over regular podium rider, Thomas Lawton. Al the top 7 Sportsman finished on 10 laps each. The final class of the day was the Novice group with Ricky Dennis topping the category from Chris Cannon and Simon Jones in 2nd and 3rd spot respectively and all on 9 laps each. The event was a rip-roaring success for all concerned, all ages, all skill levels, 2 wheels and 4, WOR as always send a massive thank to all involve din running the events, from staff through to caterers and medics, Sponsors, cameramen and media but most importantly the riders for supporting the events in the masses.